A consumer's capacity to afford a house. Affordability is usually expressed in terms of the maximum price the consumer could pay for a house and be approved for the mortgage required to pay that amount. Calculating the Maximum Affordable Sale Price: The affordability calculation is fairly complex when done correctly, and some approaches oversimplify it. The calculation also involves a number of assumptions that affect the answer. To do it properly, affordability must be calculated three times using an “income rule,”a “debt rule,” and a “cash rule.” The final figure is the lowest of the three. When affordability is measured on the back of an envelope, usually it is based on the income rule alone, ignoring the other two. This can result in error. The income rule says that the borrower's monthly housing expense (MHE), which is the sum of the mortgage payment, property taxes and homeowner insurance premium, cannot exceed a percentage of the borrower's income specified by the lender. If this maximum is 28%, for example, and John Smith's income is $4,000, MHE cannot exceed $1,120. If taxes and insurance are $200, the maximum mortgage payment is $920. At 7% and 30 years, this payment will support a loan of $138,282. Assuming a 5% down payment, this implies a sale price of $145,561. This is the maximum sale price for Smith using the income rule. The debt rule says that the borrower's total housing expense (THE), which is the sum of the MHE plus monthly payments on existing debt, cannot exceed a percentage of the borrower's income specified by the lender. If this maximum is 36%, for example, the THE for Smith cannot exceed $1,440. If taxes and insurance are $200 while existing debt service is $240, the maximum mortgage payment is $1,000. At 7% and 30 years, this payment will support a loan of $150,308. Assuming a 5% down payment, this implies a sale price of $158,218. This is the maximum sale price for Smith using the debt rule. The required cash rule says that the borrower must have cash sufficient to meet the down payment requirement plus other settlement costs. If Smith has $12,000 and the sum of the down payment requirement and other settlement costs are 10% of sale price, then the maximum sale price using the cash rule is $120,000. Since this is the lowest of the three maximums, it is the affordability estimate for Smith. When the cash rule sets the limit on the maximum sale price, as in the case above, the borrower is said to be cash constrained. Affordability of a cash-constrained borrower can be raised by a reduction in the down payment requirement, a reduction in settlement costs, or access to an additional source of down payment—a parent, for example. When the income rule sets the limit on the maximum sale price, the borrower is said to be income constrained. Affordability of an income-constrained borrower can be raised by a reduction in the maximum MHE ratio, or access to additional income—sending a spouse out to work, for example. When the debt rule sets the limit on the maximum sale price, the borrower is said to be debt constrained. The affordability of a debt-constrained borrower (but not that of a cash-constrained or income-constrained borrower) can be increased by repaying debt. Affordability will be affected by changes in the assumed maximum MHE and THE ratios, which vary from loan program to program and can also vary with other characteristics of the loan such as the down payment. Affordability may also be affected by changes in the assumptions made regarding settlement costs, taxes and insurance, interest rate and term. Some Estimates: The table below provides some ballpark estimates of how much house a borrower can afford with a 7.5% two point mortgage for 30 years. 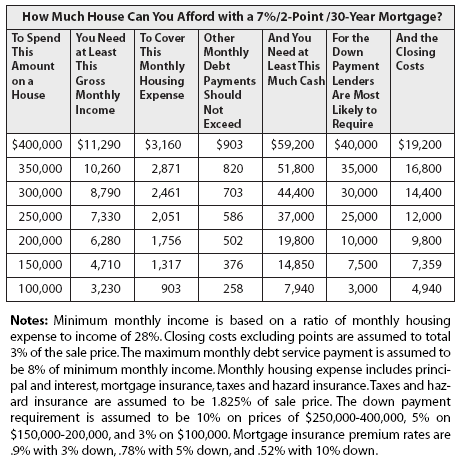 For each of seven sale prices, the table shows the total cash required to meet down payment requirements and settlement costs, the total monthly housing expense, the minimum income required to cover housing expenses and the maximum amount of debt service allowable on the minimum income. These numbers were calculated from the Housing Affordability calculator (5a) on my Web site. The assumptions used are not likely to apply exactly to any individual situation. However, readers can use the calculator to change any of the assumptions as they please. The table assumes that the borrower pushes buying power to the limit. In particular, the table assumes that the down payment is the lowest lenders are willing to accept, which requires mortgage insurance that increases borrowing cost. This may not be prudent. See Housing Investment.